Offering a flagship feel at half the price of its competitors, the Oppo R9s is one of the best mid-range handsets on the market, though don't expect stellar game performance. 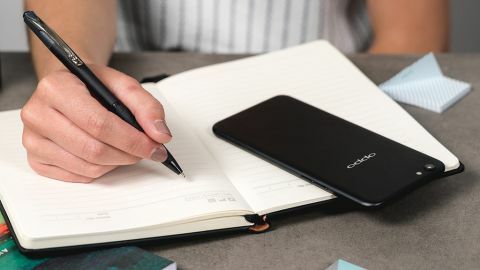 Steadily climbing its way into the number one position among smartphone makers in China, Oppo has made a name for itself by offering customers premium-feeling handsets at half the price of the competition. With this strategy, it’s perhaps no surprise that the company owns 23 percent of the market share in its home country (by comparison, Apple currently holds a 6 percent market share in China). Now, its latest handset, the Oppo R9s, has just launched in Australia, and we got our hands on one for review. Looking at the Oppo R9s in its naked form, it’d be easy to mistake it for an iPhone 7 – its thin, rounded aluminium body, slightly-protruding camera bump, matte finish and similarly-placed buttons seem clearly modelled after the Apple flagship (though its pill-shaped capacitive home button gives its Android status away), as does its new iOS-aping ColorOS 3.0 software. But what the phone may lack in design originality, it makes up for in sheer value. Though it has a retail price of AU$599 (around US$457 and £365), many of the hallmarks we’ve come to expect from a premium phone are present here. With the R9s, Oppo has produced its most polished phone to date. Though its success in China is a given, does the Oppo R9s have what it takes to become the king of mid-range phones in the western world? Though it’s only non-Asian market is Australia at present, its success here could open up wider avenues for Oppo in the future. And if it doesn’t happen, it won’t be for fault of this impressive handset. So far, there's no word on when the Oppo R9s will arrive in the US and UK, but we'll keep you updated on any developments. However, it is currently available in Singapore at a price of S$679. As was mentioned earlier, the iPhone 7 was a clear touchstone in the Oppo R9s’ design. Smooth and rounded, the only sharpness you’ll find here is in the screen’s edges, which aren’t quite as close to the handset as they are on Apple’s flagship. It is thinner, though – the Oppo R9s is 6.6mm thick, compared to the iPhone 7’s 7.1mm. It’s rather slippery in the hand, but thankfully, Oppo has included a clear silicone case and an already-applied screen protector with each handset. Like the iPhone 7, the Oppo R9s has a capacitive touch home button which doubles as a fingerprint sensor, and while it doesn’t provide the faux ‘click’ sensation of Apple’s handset, it does offer a slight tremor when pressed. Where it does have Apple beat, however, is in its speed – the Oppo R9s offers one of the fastest sensors we’ve ever experienced, seemingly unlocking the phone instantly. It’s also got a hydrophobic membrane over it which helps the sensor register your prints, even when your digits are moist. Whether this means the sensor offers less security than its rivals is unknown, though after numerous attempts, no one other than myself was able to unlock the handset. Joining the home button are two capacitive ‘recents’ and ‘back’ buttons, which are set in that order from left to right – Galaxy-style. Again, like the iPhone, the device’s power button sits on the right edge and two volume buttons on the left. A dual SIM tray offers space for (you guessed it) two nano-SIM cards, or one SIM card and a microSD card up to 256GB to join the device’s 64GB of onboard storage. On the bottom of the phone, you’ll find a speaker grille, a micro USB port and, thankfully, a 3.5mm headphone jack. At first glance, you might not notice the antenna lines across the R9s’s back. Though the R9s shares the iPhone 6’s antenna placement, its ultra-fine “six-string” antenna layout is almost invisible from certain angles, giving it more of an iPhone 7-like appearance.